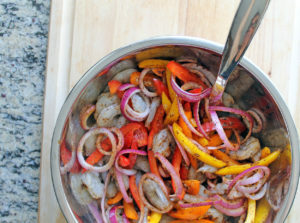 I don’t know about you, but I’m all about simple cooking in the summer! 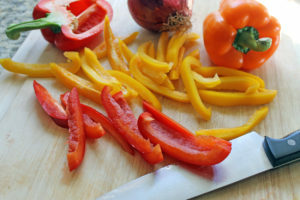 There are so many other fun things to be doing in the summer than cooking, and besides who wants to heat up the kitchen when it’s already hot outside. 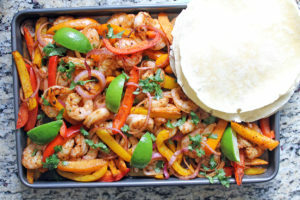 That’s why I love this recipe for shrimp fajitas that I’m sharing today…it’s quick, simple, and it only involves one baking sheet. 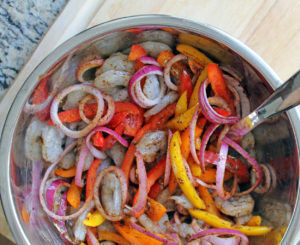 Start by chopping the peppers and onion, and then combine them with the shrimp and seasonings in a large bowl. 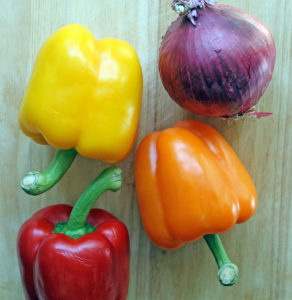 Mix it all thoroughly and spread it on a baking sheet. Then roast the mixture in the oven at 450 degrees for about 8 minutes. Turn the broiler on and cook another 2 minutes. While it’s cooking, warm the tortillas so they are ready to serve. 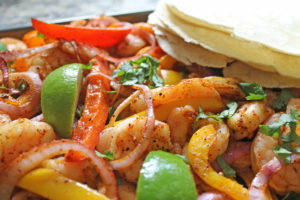 Squeeze some lime juice on it when it comes out of the oven, and sprinkle a little cilantro on top. Okay…so are you heading to the market to buy the ingredients for this yet? 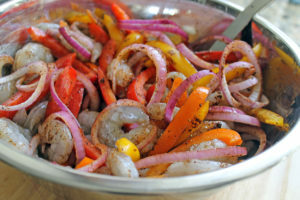 Combine the peppers, onion, shrimp, olive oil, salt, pepper, and spices in a large bowl. 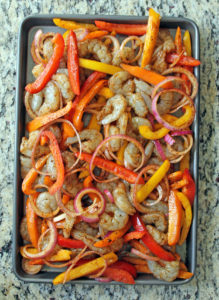 Spread shrimp, peppers, and onions on the baking sheet. Cook at 450 degrees for about 8 minutes. Turn the oven to broil and cook for another 2 minutes. Squeeze lime juice over the mixture after removing from the oven. Sprinkle fresh cilantro on top. Serve with the warm tortillas.